Theme: Oxford Dictionaries recently announced post-truth as its 2016 international Word of the Year. Oxford defines the word as relating to or denoting circumstances in which objective facts are less influential in shaping public opinion than appeals to emotion and personal belief. In 2005, Stephen Colbert coined the term "truthiness" which Wikipedia defines as "a quality characterizing a 'truth' that a person making an argument or assertion claims to know intuitively 'from the gut' or because it 'feels right' without regard to evidence, logic, intellectual examination, or facts." Below we have included several tips and suggestions for being a savvy consumer of information - whether it comes from social media, news sites, or a text from your friend. Many of the resources on this page come from an article by librarian Joyce Valenza, an Assistant Professor of Teaching at Rutgers University School of Information and Communication. Who says? - Click on the 'About Us' or 'About Me' section of a website to evaluate the site's credentials and possible biases. Check sources - Click links - try to find the original study or news article being referred to and make sure it actually says what your source claims. Look for multiple sources - While every news organization is looking for a 'scoop,' if no one else is reporting something, it may be cause for a deeper look. If it seems too good to be true, it probably is - Trust your instincts. Inflated headlines and outrageous claims all deserve a closer look. Be cautious of absolutes like 'always' or 'never' - things are rarely that clear-cut. Beware of cherry-picking - Just because a source is presenting accurate information it doesn't mean it's presenting all the information. Look out for sites that only present facts favorable to their position. Pictures can lie - Images and video can be manipulated. Use the same criteria to evaluate images that you would to check words. Even if an image hasn't been manipulated, it may be not be accurately described. Is this an ad? - Fake news sites and content farms often create outrageous headlines hoping for clicks, which earn them money through advertising. Check the Web address - Look for unusual domain names. Fake news sites often try to mimic a real news organization but change the .com to .co, or get the name slightly wrong. Questions to ask when evaluating authors, articles, and web sites. NewsGuard is a plugin you can install on your Google Chrome browser that will automatically provide a stoplight-style rating (red, orange, green) of any online news source you visit, with easy access to "nutrition label" write-ups on each source. Read more about the product in this Wired Magazine article. This helpful chart was created not by a journalist but by a patent attorney with a degree in English and a passion for analyzing the media. Despite her lack of formal expertise in this field, her analysis is sound and based on more scholarly articles from the Pew Research Center and MediaBiasFactCheck. The chart has gotten a ton of press and has been continuously improved and updated, so be sure to go to the source to see the latest version (it is not auto-updated on this site), and to read about how it was compiled. Otero, Vanessa. 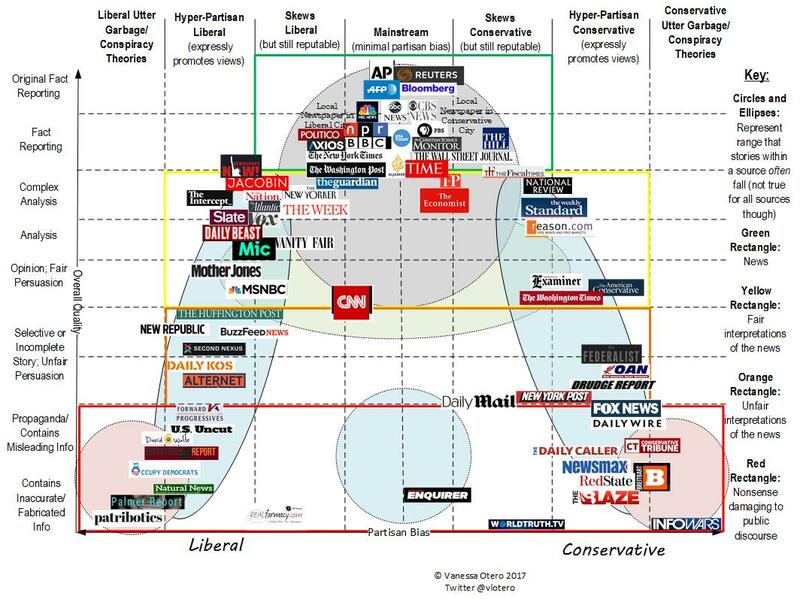 Media Bias Chart 3.0. All Generalizations Are False, 8 Nov.
2017, www.allgeneralizationsarefalse.com/. Accessed 21 Nov. 2017. Chart. Balance - equality between the totals of the two (or more) sides of the account. Balance is a more technical term than fairness. It's a quantitative measurement that can be used as a tool to achieve fairness, especially in cases where the facts are in dispute or the truth is still developing. Bias - a predisposition that distorts your ability to fairly weigh the evidence and prevents you from reaching a fair or accurate judgment. Clickbait - a sensationalized headline or piece of text on the Internet designed to entice people to follow a link to an article on another Web page. Confirmation Bias - pursuing information that reassures or reflects a person’s particular point of view. Content Farm - a website that exploits the way search engines retrieve and rank pages by incorporating popular search terms and topics in its content, often with little attention to the originality, appropriateness, or quality of the subject matter, in order to elevate the ranking of its articles in online search results and attract advertisers. Context - background or ancillary information that is necessary to understand the scope, impact, magnitude or meaning of new facts reported as news ... the circumstances that form the setting for an event or statement ... ideas or facts that give greater meaning to a news report so that it can be fully understood and assessed. Glurge - the body of inspirational tales which conceal much darker meanings than the uplifting moral lessons they purport to offer, and which undermine their messages by fabricating and distorting historical fact in the guise of offering "true stories." Glurge often contains such heart-tugging elements as sad-eyed puppies, sweet-faced children, angels, dying mothers, or miraculous rescues brought about by prayer. These stories are meant to be parables for modern times but fall far short of the mark. Hoax - something intended to deceive or defraud; to deceive by a hoax; hoodwink. Propaganda - information, ideas or rumors deliberately spread widely to help or harm a person, group, movement, institution or nation. It is often biased and misleading, in order to promote an ideology or point of view. Satire - the use of irony, sarcasm, ridicule, or the like, in exposing, denouncing, or deriding vice, folly, etc. Urban Legend - a specific class of legend, differentiated from "ordinary" legends by their being provided and believed as accounts of actual incidents that befell or were witnessed by someone the teller almost knows (e.g., his sister's hairdresser's mechanic). These tales are told as true, local, and recent occurrences, and often contain names of places or entities located within the teller's neighborhood or surrounding region. Use the criteria below to evaluate the appropriateness of a website for academic research.